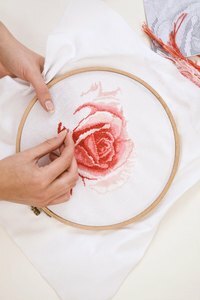 Making cross-stitched patterns is a relaxing pastime that lets you create beautiful pictures or patterns on cloth. Once complete, instead of framing the cross-stitch, sew your work onto the front of a decorative pillow or a removable pillow case. Use coordinating trims to frame your cross-stitch design. Whether you use a closed throw pillow or a pillow with a removable cover, there are only a few steps needed to hand sew your cross-stitch onto the pillow. Trim around the edges of the cross-stitch with sewing shears to create straight, even sides. Leave as much border around the design as desired, as long as it will fit onto the pillow. Position the cross-stitch on the top of the pillow and pin in place with straight pins. Thread the needle with coordinating thread, pull the ends together and knot the end. Stitch around the cross-stitch, removing the pins from one side at a time. Use small, straight stitches to attach the cross-stitch to the pillow fabric. Ensure that the cross-stitch lies flat as you work around each side. Cut a piece of trim to the length of each side of the cross-stitch. Apply double-sided fabric adhesive tape to the back of each piece of trim and place over the raw edge of the cross-stitch. Press the finished piece with a warm iron, using a pressing cloth on top of the cross-stitch to avoid burning the cross-stitch or getting glue residue on the iron. Cover the corners where the trim overlaps with decorative buttons. As an alternative to four pieces of trim and buttons, cut one long length of trim and miter the corners like a picture frame, then hand-stitch onto the edges of the cross-stitch. If you prefer not to add trim to the hand-sewn cross-stitch, press the edges under and use a decorative overcast stitch to finish the edges. Overcast stitches are equally spaced diagonal stitches used to hand sew appliqués to fabric.